Stretch your improv muscles with Precipice! Whether you've never performed improv or you're a seasoned veteran, we have improv workshops that are sure to help you grow. 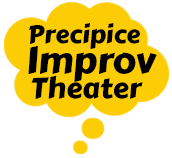 At Precipice, we are proud to offer free sample improv classes year-round. You will participate in simple (but fun!) theater games and exercises that stimulate your imagination and exercise your creativity in a supportive atmosphere. What's more, you can simply observe or actually participate. But audit space is limited, so you must reserve a place on our contact form. Taking place on Sunday afternoons at 2:30 p.m., these classes are offered at the FAES Social and Academic Center (9101 Old Georgetown Road, Bethesda, MD 20814). With an 8-week semester, this course is offered on Sunday afternoons at 2:30 p.m. year-round. Enrollment is just $240, and it also takes place at the FAES Social and Academic Center (9101 Old Georgetown Road, Bethesda, MD 20814). Reserve a place via our contact form. "Class was a great release. I think my inner comic genius started to eek out! Overall it was a blast!" 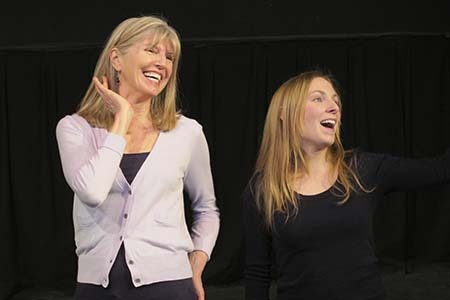 — Lauren K.
For those with improv experience, this class gives you the chance to work at more challenging levels of creativity by improvising 20- to 60-minute plays. This workshop--designed from 20 years of research and using the same methods that trained the Precipice performing company--uses exercises that are both fun and rigorous, stretching your creative muscles in an exciting and supportive environment. You will learn principles for creating compelling and believable characters, riveting scenes, and exciting plays that are as good as the best-scripted work being written today. The class meets every week during the year at the FAES Social and Academic Center (9101 Old Georgetown Road, Bethesda, MD 20814). You can start at any time, and we charge $240 for 8 weeks. Use our contact page or call us today to learn more or make reservations. The hardest and most exciting part of any scene or piece is the opening. Because at the start, the improviser confronts a dizzying array of possibilities. Creating something from nothing (even with an audience suggestion) is hard. The workshop will teach you three sure-fire ways to start scenes, guaranteed to both generate chemistry with your scene partners and grab the audience’s attention. The teacher will also work with each participant to identify their unique ways of starting scenes, evaluate their effectiveness, and invite them to explore other options and possibilities. After a scene has started, what then? How do you keep it going? One of the dirty little secrets of improv is that most scenes will stall eventually, even if you follow all the rules of good scene structure. That is why improvisers have created so many ways for transitioning to other scenes, and so many formats for keeping the scenes short. But this creative effort is expended out of necessity, not out of choice. What if you were confident that your two-person scenes would maintain their initial excitement until you decide on an artistically satisfying ending? This workshop will teach you three simple principles that allow you to reliably produce the thrill always present in great improv. And if the scene does stall, you will know what to do because the workshop will show you four techniques for addressing this issue. This class is offered intermittently throughout the year at a time convenient to the participants. To put your name of a waiting list for the next class, please use our contact form to let us know your interest. There’s a lot to learn to do good improv. You have to develop acting, playwriting, and directing skills, and to do them spontaneously with others. Broken down into their component parts, there are probably twenty to thirty separate skills you need to know and practice when on stage. 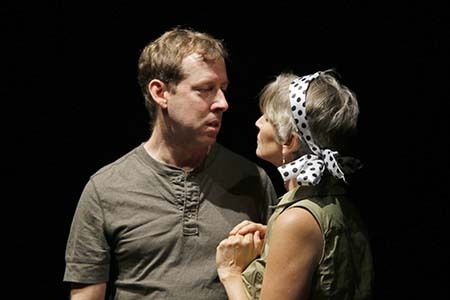 What is often overlooked is the notion of onstage chemistry. “Chemistry" is not only what we find in a romantic comedy. Real chemistry must happen between any two actors on stage for the audience to believe their interaction. Without chemistry, the audience cannot suspend their disbelief enough to love the show. This workshop will show you, step-by-step, how to develop chemistry with your scene partners, both in two-person and multiple-person scenes. You will increase your sensitivity to whether chemistry is present between you and your scene partners and learn how to help your fellow players ignite that chemistry when you notice it missing in a scene. "Gary's classes still blow my mind after 3 years. Sheer genius." Students who complete the Improv-For-Everyone and Principles Workshops are eligible to apply for enrollment in Precipice's Play-Improvising and Performance Workshop. This workshop meets once a week at mutually-agreed upon days and times, and it provides students with the opportunity to participate in 8-12 performances a year in a 150-seat theater. Students receive intensive and personalized improvisation training that encompasses playwriting, directing, character work, and advanced scene work. The course takes place at the FAES Social and Academic Center (9101 Old Georgetown Road, Bethesda, MD 20814). For further info, and to obtain an interview to determine class eligibility, contact us today. James Joyce said that writing is "the most ingenious torture ever devised." But, what if it doesn't have to be? Some writers report that when writing, they enter another world, where words and ideas flow easily, and writing problems evaporate. This course reproduces that experience using improv exercises to teach you to engage your material on an emotional level fully while bypassing the roadblocks of your internal critic and accessing your wellspring of creativity. Designed for both writers and actors, this workshop helps you gain greater access to your imagination. While writers find it helpful in stimulating their creative impulses, you needn't be a writer to benefit from the expansion in your creativity. Offered once a year at The Writer's Center (4508 Walsh Street, Bethesda, MD 20814), the course costs $200. Contact us today to find out when this workshop is being offered. Or, call (301) 654-8664 to put your name on a list to be notified of the next class.